Totally optional additional mix-ins: ½ cup chocolate chips (when granola completely cool or will melt) or one half cup coconut flakes* (add unsweetened coconut flakes halfway through baking). Stir in up to 2 teaspoons of fresh orange zest for added flavor. Preheat oven to 350 degrees Fahrenheit and baking sheet with parchment paper. In a large mixing bowl, combine the oats, nuts and or seeds, salt and cinnamon. Stir to blend. Pour in the oil, maple syrup and or honey and vanilla. Mix well, until every oat and nut is lightly coated. 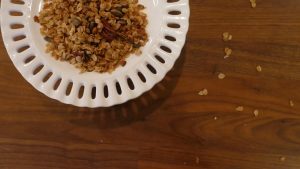 Pour the granola into prepared pan and spread in an even layer. 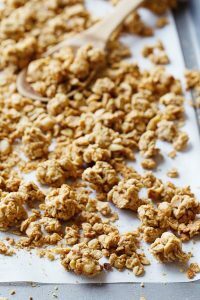 Bake until lightly golden, about 21 to 24 minutes, stirring halfway The granola will further crisp up as it cools. Let the granola cool completely. If desired top with your choice of dried fruit (and chocolate chips if using).